When John Glover arrived in Tasmania at the age of sixty three after a long and successful career as a watercolourist and landscape painter in England, his compositions were criticised for being formulaic and mannered, but the landscape of his new home so reinvigorated his art that he was to produce some of the most visionary images of the Australian landscape. Italy was a favoured subject of many artists of the ninteenth century due to its connections with the major figures of landscape painting, Claude, Poussin and Rosa. It was also much admired by Glover - it was the place where he received some of his earliest training as an artist, and represented for him the essential subject of landscape painting. 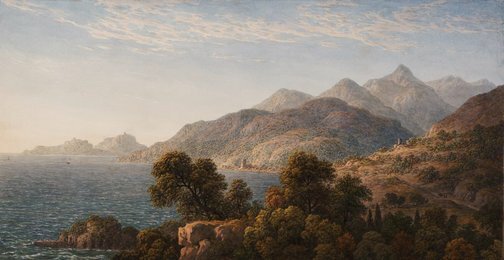 The wild, rocky mountains and clear light-filled sky in 'The Italian coast near Naples' are an antecedent to the transparent landscapes that characterised Glover's antipodean work. Signed and dated l.r. corner on original window mount, black ink "J Glover 1828". Rex Irwin Art Dealer, Sep 1986-Oct 1986, Sydney/New South Wales/Australia, Purchased by the Art Gallery of New South Wales from the exhibition 'John Glover 1767-1849' held at Rex Irwin Art Dealer, 20 September - 28 October 1986. Christopher Allen, The Australian weekend review , 'Real-world views', 22 Jul 2017-23 Jul 2017, pp 10–11: col illus p 11. Hendrik Kolenberg, 19th century Australian watercolours, drawing and pastels from the Gallery's collection , 'Introduction', pg. 6-16, Sydney, 2005, 9, 25 (colour illus.). Victorian watercolours from the Art Gallery of New South Wales , Sydney, 2017, pp 100–101, col illus p 101. Anne Ryan, Australian art: in the Art Gallery of New South Wales , 'Colonial eyes', pg. 17-18, Sydney, 2000, 18, 22 (colour illus. ), 300. Martin Terry, Look , 'The Italian Coast near Naples', Heidelberg, Jun 1987, 20-21 (colour illus. ).